This book provides a systematic and comprehensive treatment of the variety of methods available for applying data reconciliation techniques. Data filtering, data compression and the impact of measurement selection on data reconciliation are also exhaustively explained. Data errors can cause big problems in any process plant or refinery. Process measurements can be correupted by power supply flucutations, network transmission and signla conversion noise, analog input filtering, changes in ambient conditions, instrument malfunctioning, miscalibration, and the wear and corrosion of sensors, among other factors. Here's a book that helps you detect, analyze, solve, and avoid the data acquisition problems that can rob plants of peak performance. 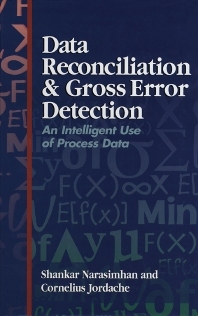 This indispensable volume provides crucial insights into data reconciliation and gorss error detection techniques that are essential fro optimal process control and information systems. This book is an invaluable tool for engineers and managers faced with the selection and implementation of data reconciliation software, or for those developing such software. For industrial personnel and students, Data Reconciliation and Gross Error Detection is the ultimate reference. : Introduction. Measurement Errors and Error Reduction Techniques. Steady State Data Reconciliation for Bilinear Systems. Nonlinear Steady State Data Reconciliation. Data Reconciliation in Dynamic Systems. Introduction to Gross Error Detection. Multiple Gross Error Identification Strategies for Steady State Processes. Gross Error Detection in Dynamic Processes. Design of Sensor Networks. Industrial Applications of Data Reconciliation and Gross Error Detection Technologies. Appendix A: Basic concepts of linear algebra. Appendix B: Basic concepts of Graph Theory. Appendix C: Statistical Hypotheses Testing. Shankar Narasimhan, Ph.D. (Ch.E. ), has participated in the practical design and implementation of an industrial package for data reconciliation and gross error detection. He has published many significant papers on various aspects of this vast area since receiving his MS and Ph.D. in Chemical Engineering from Northwestern University. Cornelius Jordache, Ph.D. (Ch.E), received his MS and Ph.D. in Chemical Engineering from Northwestern University. He has since held leading industrial positions developing online data reconciliation and gross error detection systems. He also has extensive experience in training engineers and other personnel in the implementation and maintenance of data reconciliation software.